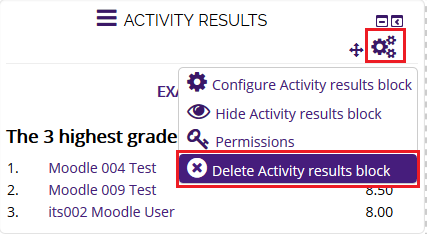 The Activity Results block displays results from graded or rated activities in a course. It can be set to display on the main course page, or on the page of a specific activity. The block will display grades from quizzes, assignments, lessons, and workshops. If using this block, be sure to follow all FERPA policies. 3. Scroll down to the bottom of the page. On the right hand side, select Activity Results from the Add a Block drop down menu. 4. The page will refresh and the block should appear. Click Actions (the gear icon) and select Configure Activity Results Block from the drop down menu. 5. Enter in the necessary information. You can choose which activity the results should come from, how many results you want to show, and the privacy of the results. If this is a graded item, consider FERPA regulations. 6. When finished customizing the settings, click Save changes at the bottom. 3. Locate the Activity Results block and click Actions (the gear icon). 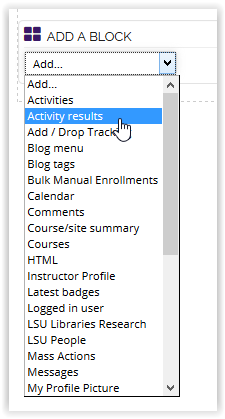 Then, click on Delete Activity results block from the dropdown menu.